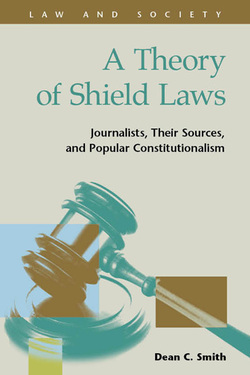 A THEORY OF SHIELD LAWS: JOURNALISTS, THEIR SOURCES, AND POPULAR CONSTITUTIONALISM by Dean C. Smith. El Paso: LFB Scholarly Publishing LLC. 2013. 297pp. Cloth $80.00. ISBN: 978-1-59332-615-9. Reviewed by Eric B. Easton, University of Baltimore School of Law, eeaston@ubalt.edu. The term “shield law” is shorthand for a testimonial privilege that allows a journalist to refuse to disclose the source of a story. Shield laws may be enacted by legislatures or created by courts. They may be broadly or narrowly written with respect to the persons entitled to the privilege, the venues where the privilege may be exercised, and the conditions imposed upon their use. Much of the shield law literature focuses on the Supreme Court’s refusal to find a testimonial privilege in the First Amendment in the 1972 case of BRANZBURG V. HAYES or on the repeated failure by Congress to enact a statute providing journalists a testimonial privilege in federal courts. Dean Smith’s new book offers a different focus: the legislative enactment of 40 state shield laws. Smith’s work opens with “the real story” of the nation’s first state shield law, enacted in Maryland in 1896. Until Smith set the record straight, it had been generally accepted that the law was enacted in response to the jailing of a BALTIMORE SUN reporter in 1886. Smith shows conclusively that the Maryland shield law was actually enacted in response to a national campaign to protect reporters in the wake of a Washington bribery scandal in 1894. According to Smith, the quest for a Federal shield law began in 1929, when reporters from Hearst’s WASHINGTON TIMES exposed a number of speakeasies catering especially to members of Congress. Legislation was introduced soon after the reporters were jailed for refusing to reveal their sources. The effort failed, but the continuing lobbying campaign ultimately generated shield laws in eleven more states between 1929 and 1949. Smith follows with a case study from 1968 in which University of Oregon student-journalist Annette Buchanan refused to reveal her source for a story on marijuana use among fellow students. Buchanan was held in contempt, and her appeal to the state Supreme Court failed. But the case did stimulate renewed discussion of a constitutional privilege and the development of a model state shield statute. Wisely omitting a laborious reconstruction of the BRANZBURG case, which has been thoroughly dissected in the literature, Smith’s history focuses on the aftermath, including serious efforts to enact a federal privilege and the enactment of eight more state statutes – including one in Oregon, often wrongly attributed to the BUCHANAN case. He also goes into some detail on the qualified privileges recognized in nine of the thirteen federal circuit courts of appeal between 1972 and 1986. Smith’s penultimate chapter discusses the half dozen state shield laws enacted in the 1990s and seven more enacted in the new century. Along the way, he considers the persistent issue of who is a journalist (and therefore covered by the shield), an issue complicated by the rise of Internet-based [*514] media. He concludes with a call for lobbying to bring modern shield laws to all 50 states and to enact federal shield law legislation. Had Smith written nothing more than this historical survey, his book would have been a useful addition to the literature. The perspective is fresh throughout and the narrative is frequently revelatory. Two principal achievements: setting the record straight regarding the origins of the ground-breaking Maryland shield law and placing BRANZBURG firmly in the middle of the shield law saga, rather than the beginning and the end of the conversation. But Smith has something more in mind. Using the state shield laws ostensibly to test a theory of “non-judicial precedents” developed by Michael Gerhardt (2008), Smith seems to be making the case that a testimonial privilege is a constitutional requirement under the First Amendment. The U.S. Supreme Court just hasn’t figured that out yet. In each chapter, Smith places the legislative activity in Gerhardt’s theoretical context. Thus, the lobbying that led to Maryland’s 1896 shield law, while advocating a legislative remedy, was articulating First Amendment norms – even before the First Amendment claim had become a viable legal argument. The dialogue on constitutional values had begun, and would continue through the lobbying for a federal shield law aftermath of the speakeasy exposé in 1929. At the conclusion of Smith’s chapter on Annette Buchanan, he points out that Gerhardt’s theory would predict that the dialogue could have one of two possible outcomes: either the popular conception of constitutional rights would be adopted by courts or it would remain outside the judicial sphere and continue to implement constitutional values through legislation. In his chapter on the aftermath of BRANZBURG, Smith shows that what actually happened was a combination of the two possibilities. More state legislatures enacted shield laws – statutes revolving in constitutional law orbit (Lupu 1993) – even as many federal circuit courts created their own versions of the privilege. Good histories always seem to end too soon, and Smith’s is no exception. Smith appears to have stopped writing while enactment of a federal shield law, once again, seemed within the realm of possibility. The Senate, at least, was arguably on the way to resolving the sticky issue of who should be covered with a test that describes the conduct of prospective witnesses, rather their employment status. This generally acceptable solution, coupled with the fact that “who is covered” had not been that significant in recent cases, leads Smith to minimize the problem somewhat. Of course, that very issue returns with a vengeance to undermine congressional negotiations in the wake of the WikiLeaks affair, which occurred after Smith’s historical account concludes. Smith’s application of Gerhardt’s theory of non-judicial precedents to the historical account of shield laws is quite satisfying and [*515] very likely to send the reader back to the original source for a closer look. Smith offers several avenues for further research, both practical and theoretical, including some on which he has already embarked. At a moment when progressive legislation at the federal level seems remote, and scholarship in support of such legislation seems futile, Smith’s marriage of history and theory affords some hope that we are nevertheless participating in the evolution of constitutional doctrine. Gerhardt, Michael. 2008. THE POWER OF PRECEDENT. Oxford, UK: Oxford University Press. Lupu, Ira. 1993. “Statutes Revolving in Constitutional Orbits.” VIRGINIA LAW REVIEW 1. BRANZBURG V. HAYES, 408 U.S. 665 (1972). OREGON V. BUCHANAN, 436 P.2d 729 (Ore. 1968). © Copyright 2014 by the author, Eric B. Easton.